SICK provides the tools for customers to make ambitious modernisation projects a reality. 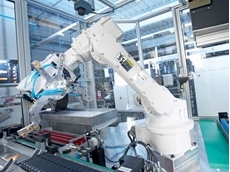 Human-robot collaboration (HRC) describes an environment where humans and automated machines share and work in the same workspace at the same time. 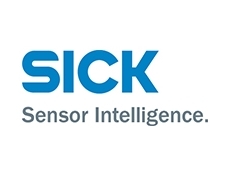 SICK has established itself as the first port of call when it comes to industrial safety technology. Presence sensing systems such as safety light curtains and safety scanners should be used when physical guards are not suitable. In the early days of the industrial revolution labour was cheap and there was relatively little regard for the suffering of injured workers. But times have changed and more emphasis is now placed on the safety of those who work with machines. These days new guarding systems are developed and incorporated into new and existing machinery. The challenge is to continue to improve existing safety of machinery and, as technology develops, to manage new safety hazards. Pressures of a global playing field and different safety standards around the world make it even more challenging. Whether he/she is involved in design, production or maintenance, the modern day engineer is faced with increasingly complex machinery that requires increasing levels of protection and existing machinery that needs to comply with today’s relevant laws, regulations and standards. While this may sound challenging, there are principles and processes that have been developed into regulations and standards. The overriding principle when designing any safeguards for machinery and plant is that it must keep operators safe. Experience shows the most cost effective way to achieve this is to consider the potential risk of exposure to hazards during the design phase. This will enable the designer to design out any exposure to hazards, taking into account the need to reduce speed, temperature and pressure to an acceptable level. What about existing machinery? The same applies. It is necessary to design a system that also complies with current day legislation. The first step is to understand the laws, regulations and standards. The new national harmonised OHS laws promise to remove confusion and provide a transparent national legislative framework for industry to follow. Currently there are four states that are yet to enact the changes. Tasmania has the bill before parliament. South Australia and Western Australia have no legislative action, while Victoria is likely to delay legislation until 1 January 2013. Harmonisation will happen. It’s just a question of time for the Federal Government to provide the necessary concessions to enable the states to work towards passing the bill. Then there are the regulations and codes of practice that point us towards Australian Standards that will ensure we have designed and selected the correct interlocking system based on the risk of exposure to the hazard. The law requires that risk is eliminated. If this is not possible, then engineers must minimise risk. In addition, by law, when access to machinery is not necessary, permanently fixed guards must be employed. If access is required during operation, maintenance or cleaning, it is necessary to provide a guard that is interlocked. An interlock guard is one that is movable or has a movable part. The movement of the guard interacts via a switch connected to the control system which prevents movement of dangerous parts while the guard is open. There is still more that needs to be considered. For example, if a switch has been incorporated, how do operators know which switch to use? Or similarly, how should the control system be designed? Standard AS4024.1 – 2006 Safety of machinery covers the use of interlocking systems. The standard is divided into six sections covering safety principles, risk assessment, ergonomic principles, design parameters, ergonomics and displays (controls, actuators and signals). What about a guard that is not welded and is not interlocked? i.e. a fixed barrier that can be removed with tools. In this case, caution is urged. And the tool selected should not be in the possession of the operator. There is a hierarchy of control which runs from elimination to substitution then to engineer control; and from there to administrative and to personal protective equipment. Operators always attempt to perform their duties in an efficient manner and assume the guarding will protect them. But they sometimes manipulate or bypass the very devices introduced to protect them. Generally, they do so because they feel the guarding is annoying or badly design. Given this fact, manipulation needs to be considered and it should be as difficult as is reasonably practicable to do. Where physical guards are not suitable, the hierarchy of control allows the use of presence sensing systems such as safety light curtains, safety scanners, safety mats or bumpers. Even though presence sensing systems are the last step in the hierarchy of control, they are the only solution when looking at frequent access. 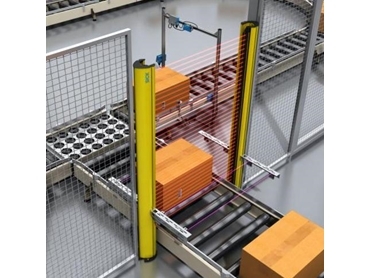 When used correctly, they can offer productivity improvements such as the ability to load and unload machines more efficiently by reducing time taken to open and close doors and remove potential hazards introduced through the use of physical barriers. A great example of the use of presence sensing systems is on entry and exit of palletisers by using muting sensors to differentiate between products and humans. Using captive key type systems, there is the problem of trailing - where an operator can follow another operator into the machine danger zone through the physical gate without applying a tag or using the captive key system. This can be prevented by using a safety scanner to monitor if the operator is in the danger zone of machine. This will avoid unexpected start ups. Safety scanners are also used on AGV’s as an anti-collision solution and for personnel protection. Where necessary, risk reduction follows a risk assessment by applying suitable protective measures. A new risk shall not result from the application of protective measures. The repetition of the entire process, risk assessment and risk reduction, may be necessary to eliminate hazards. A collective approach is most suitable in this area. Otherwise, the engineering department may design a safety system that complies with standards, but doesn’t take into account the requirements of machine operators (generally around cleaning and maintenance). The end result may look great on paper, but run the risk of being bypassed and manipulated. Decision makers in industry are responsible for their employees as well as for cost-effective production. Only if management makes safety part of everyday business will employees embrace the topic. It is vital that the needs of operators and maintenance personnel are included in the planning at concept level. Only an intelligent safety concept matched to the operator task and the personnel will result in the necessary acceptance and buy in.